I, of course, prefer wavy parrots, but the turtles are also very sympathetic. There were three opal beads in my bins. For a long time I looked at them until finally I decided where to adapt them. 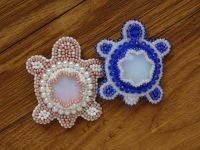 I saw in these beads of future turtles. No sooner said than done! 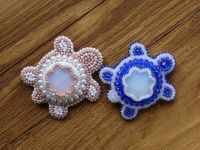 Here they are - the two little turtles. 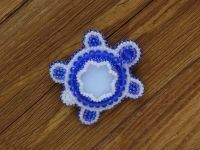 Turtles are coming! 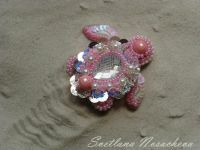 This turtle is embroidered with paillettes and beads. It turned out pink, like marshmallow, very tender. 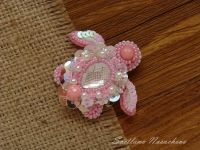 The front paws of this tortoise on the wire frame, the silk fabric is stretched on the wire and embroidered with pink threads, beads and sequins with the effect of the hologram. 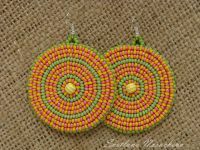 And this earrings of beads. 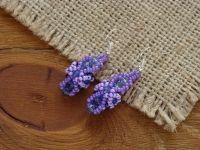 Beaded bead earrings of different colors - red, purple, white. 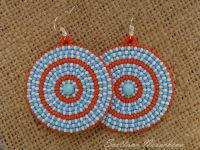 Earrings of handwork are bohemian, ideal for solemn events, special occasions. 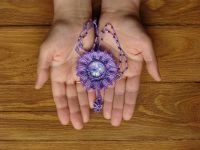 Made a purple pendant in the form of a flower. I had a cabochon, I bought it on the occasion, glass. And on it - an image of blue poppies (Himalayan poppy or mekonopsis). 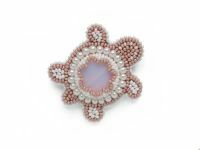 And so I liked those flowers on the cabochon, that I admired and thought for a long time about how to apply this cabochon better. And I thought of making him a poppy flower. 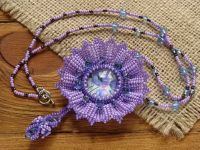 I took the beads under the color of a cabochon, covered with it and turned out such a purple flower - almost that mekonopsis! Frida Kahlo himself! 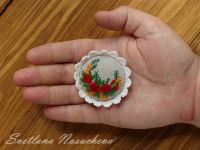 Finally I made this brooch, of course, inspired me self-portraits of this famous Latin American artist. I used to often see pictures of Frida Kahlo, but I did not know who that woman was. And this, it turns out, is a real brand! I became acquainted with him thanks to Wikipedia. The story of this woman so touched me, struck her intermittent patience and the numerous sufferings that fell on her share. Of course, I wanted to perpetuate the image of this famous diva in my own way. 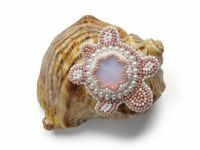 Recently, more and more often became interested in creating jewelry at a professional level. I watch TV channels of fashion, magazines about fashion, photos of fashion brands. In a word - I get inspired and draw ideas to displace the usual ones out of my understanding, and in return take unaccustomed directions for me and gradually master it. 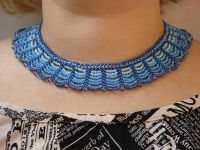 I hope this collar will serve as a new starting point for creating a new fashionable line of beaded jewelry in my store. 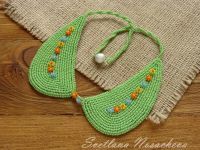 A little bit strange and charming Boho style. Here are such circles on the water, dartboard targets and something else that you imagined. 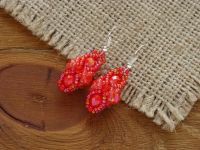 This is an earring. My new invention. 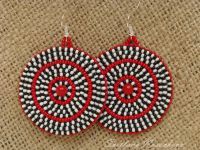 Round, flat, earrings disks embroidered with beads. 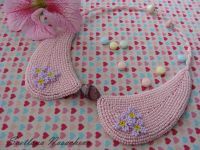 Collars continue. Inspired by the first result, I decided to make one more, in a different color. This time the colors of fresh salad leaves turned out! 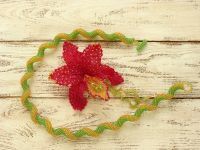 First I wanted to embroider with a whole beaded tinsel, to get such a "lawn", but then changed her mind, did not become heavier. 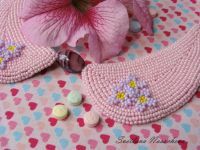 She went on the principle of minimalism and added just a few tiny flowers. The result was pleased. 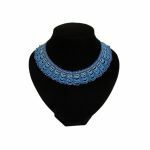 True, my brother on skype saw a collar on a mannequin and joked "What are you - a brasshelter embroidered?" 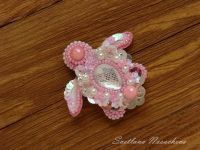 I decided to try myself in a new creative direction and embroider a brooch not with beads, but with embroidery threads. 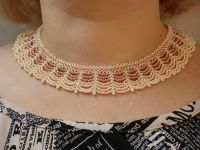 This French technique is known under the name Rococo. 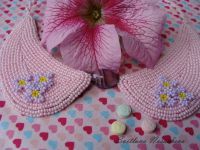 When I was little, my grandmother knitted hats and mittens from rabbit fuzz and embroidered them with bright threads, beautiful flowers, roses and rococo daisies. 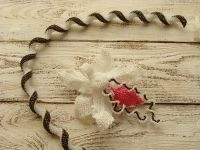 She was a skilled needlewoman, she knew a lot - to knit, embroider in different techniques, she owned the craft of spinning yarn from sheep's wool. 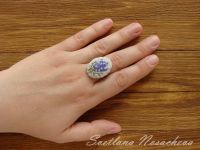 I thought - why do not I expand the assortment, thereby attracting a large audience of fans of handmade jewelry. 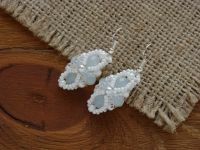 And now I continue to work on creating jewelry with hand embroidery. 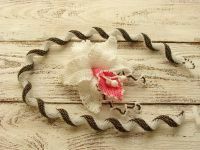 The frame of the brooch is crocheted lace. 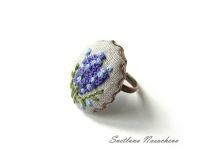 I was fascinated by embroidery with a French knot or rococo. 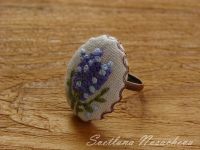 Here is a ring embroidered with a textile cabochon made of linen cloth. 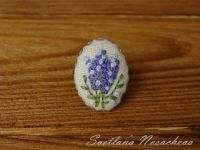 A branch of lavender is embroidered with Soviet threads "muline", which they bought as a schoolgirl. Here is the quality! 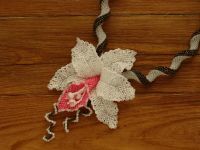 They kept the color until now, checked for a break - stronger than those that have now bought some modern for embroidery. 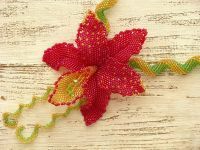 Traditionally, every embroidery is washed in cold water with soap (so that the strings are properly laid back, the washed embroidery looks more aesthetically pleasing), the threads do not shed! Here is the quality! It's a pity there are not many of them. 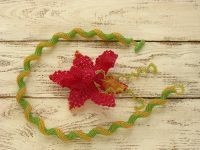 In my childhood, I embroidered cushions with these threads. Недавно серьги продались из набора к этому колечку. А вот на днях сделала повтор - темно-вишневую орхидею, колье-трансформер. Сам цветок орхидеи съемный кулон, а витой жгут можно носить как самостоятельное повседневное ожерелье. А орхидею - по особо торжественным случаям. Когда-то давно сделала красную - она сразу ушла. Потом сделала белую орхидею, она почему-то застряла. Решила сделать красную, посмотрим, оценят ли. Да, думаю, найдется покупатель, потому что уж больно красивое получается украшение на шею. 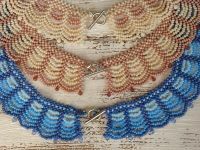 Excited to share the latest addition to my etsy shop: Classic open-work collars-necklaces braided from beads.